Some artists have a huge hit straight out of the gate - and then spend the rest of their career trying to live up to it. This week in 1991, the third single by a British band that'd had a global smash with their debut single struggled to climb very high on the ARIA chart. It was her highest charting single, but was it her best song? Meanwhile, other acts take their time to achieve their biggest hit. Also this week in 1991, a singer who'd already released a dozen or so singles and won two ARIA Awards for Best Female Artist debuted with the song that'd peak the highest for her on the top 50. The biggest single of Bryan Adams' career - and I say that safe in the assumption that he'll never better it - was still at number 1 this week in 1991. By registering a ninth week on top, "(Everything I Do) I Do It For You" became the longest running chart-topper since USA For Africa's "We Are The World". The next target? The 11-week stretch at number 1 enjoyed by "Mull Of Kintyre/Girl's School" by Wings. This single from Swedish singer Titiyo Jah should've been bigger - here and in the US, where it peaked just outside the top 40 but still featured on American Top 40. Titiyo is Neneh Cherry's half-sister. Another song that no doubt owes what Australian success it had to American Top 40 is this lead single from Karyn White's second album, Ritual Of Love. Produced by Jimmy Jam & Terry Lewis, "Romantic" topped the US chart. Having tried of releasing and re-releasing tracks from debut album Let It Bee, Voice Of The Beehive turned to album number two, the provocatively titled Honey Lingers. This lovely single flopped locally, but they'd finally have a big hit with its follow-up. Last week, Billy Bragg defied convention to venture into the ARIA top 50. This week in 1991, it was the turn of Kirsty MacColl, who'd provided backing vocals and appeared in Billy's music video for "Sexuality", to almost do the same. And, she peaked just outside the top 50 with a song that, like "Sexuality", was co-written by Johnny Marr. The hip-hop and dance-influenced "Walking Down Madison" was a change of musical direction for the British singer known more for UK hits like The Kinks cover "Days", "There's A Guy Works Down The Chip Shop Swears He's Elvis" and her remake of Billy's "A New England". It even featured a rap, from Aniff Cousins. The music video was shot on Madison Avenue, New York, and depicted the two faces of the city, as described in the song's lyrics. Before we get to this week's big new entry, we have three minor top 50 hits that didn't progress any further than their entry positions. First up, it's the song that prevents EMF from being a one-hit wonder (in the strictest sense of the term) in Australia. 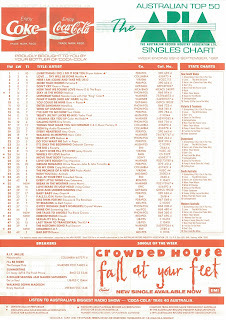 By sneaking into the top 50, "Children" achieved what previous single "I Believe" couldn't, but came nowhere near matching the success of "Unbelievable". In Australia, this was the last we saw of EMF on the top 100, while in the UK, they were finally able to match the number 3 peak of "Unbelievable" in 1995 with a cover of "I'm A Believer", recorded in collaboration with comedy duo Vic Reeves and Bob Mortimer. Earlier in 1991, their Loot EP had almost reached the top 20, but like so many other Australian indie rock bands, the going had become tougher for Clouds on the singles chart and latest release "Hieronymus" puttered out here at number 45. The track, which got its name from painter Hieronymus Bosch, appeared alongside Loot track "Souleater" on the band's upcoming album, Penny Century. That, at least, received a better reception, peaking at number 23 on the albums chart and staying in the top 100 for over half a year. Things were actually looking up for The Black Crowes who broke into the top 50 for the first time with this rock ballad from debut album Shake Your Money Maker. The song, about the type of person the band encountered on the Atlanta club scene as they were starting out, also provided them with their US breakthrough. After the top 30 success of "She Talks To Angels" on the Billboard chart, "Hard To Handle" was reissued and reached number 26 there, The Black Crowes' highest ever chart position in the States (and an improvement of nearly 20 places on its original peak). The band's biggest hit in Australia was still to come. "You're Gonna Get Hurt". "Body And Soul". "You I Know". "She Has To Be Loved". These are all songs I like much better than "Break In The Weather", which is Jenny Morris's biggest hit in Australia, held off the number 1 spot by Big Audio Dynamite II's "Rush". The lead single from third album Honeychild, the track came with a memorable video that utilised a ventriloquist's dummy and body parts from toy dolls as musical instruments - something that kind of creeped me out, which may or may not have been the intention. I didn't hate "Break In The Weather" - it was certainly a much better lead single than "Saved Me" had been - but I could never really get into it, either. Not for the first time, it seems I was alone on that score, although I suspect "Break In The Weather" might not have been quite as big had it appeared on Jenny's debut album and certainly benefitted from her increase in popularity since those days. Next week: even Bryan Adams' record company are getting bored with him being at number 1, plus two '80s acts known for one big single return to the top 50 and another member of Bon Jovi goes solo. I remember thinking the Titiyo song would probably be a hit. Unfortunate name, though. 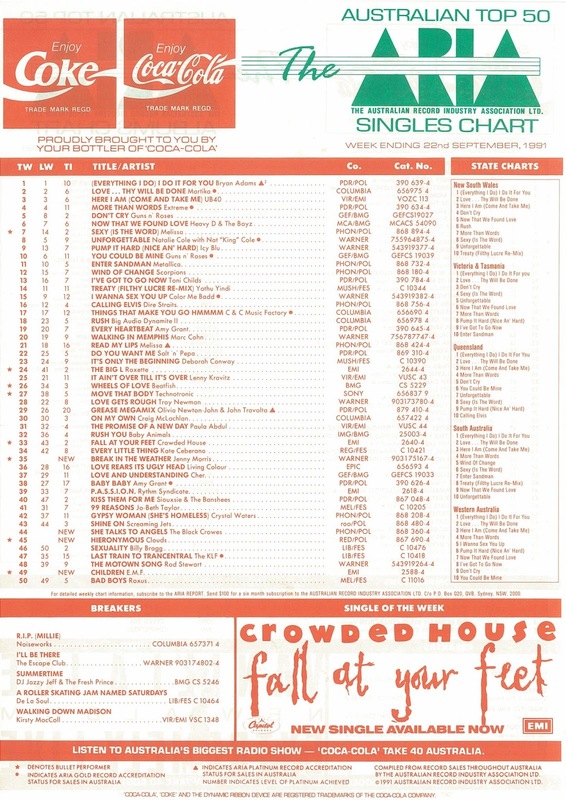 Not being familiar with the 61-100 region of the chart at the time, I'm surprised 'Romantic' did as well as #68, since American Top 40 would have been the only place I heard it. I thought 'Monsters and Angels' deserved to do much better, and that it would have. Being known for unique packaging with their UK CD singles, this one came in a 'honey' bag that was apparently motor oil! The copy I have has hardened, although not before seeping through to the disc itself to fade away some of the text on it. 'Walking Down Madison' was one of the first mp3's I downloaded. I didn't like 'Children' as much as the previous two EMF singles. Clouds having back to back top 50 'hits' was, in retrospect, a sign that 'alternative' music was about to become mainstream. I wouldn't have heard the Black Crowes song since '91. I'm pretty sure rage used to air a live performance when it was in the top 60. I always thought 'Break In the Weather' was rather Prince-esque (with cheaper production), like 'Saved Me' before it. I remember hearing it quite a bit on the radio before its chart debut, though I could never figure out what the song was called until then. Break in the Weather was my introduction to Jenny Morris and is still my favourite song of hers (even if it is just for nostalgic value), though I'm a big fan of She Has to be Loved as well. Jenny's singles from that album were very diverse and kinda edgy for an Adult Contemp. style singer back then. I remember singing along to this at school - with other students as the teacher allowed us to have the radio on. I wish I had have known about her throat problems as my biggest music regret is never seeing her perform live.